Yesterday we went out to Monticello, a little historic town east of Tallahassee, to browse in the antiques shops and look around at houses (my sister Bunny is thinking about maybe moving). Pretty much the whole family went--me, Rob, Bunny, Mom, Kris, Jake, and Sophie. One of our first stops was Tupelo’s Bakery. It was the nicest little place—sunny and airy and cheerful. Jake had a big chocolate chip cookie, and Sophie had a tiny chocolate cupcake. Rob and I got a bottle of Virgil’s micro-brewed root beer to share, and Jake was just fascinated by it. “Is that beer?” he asked. 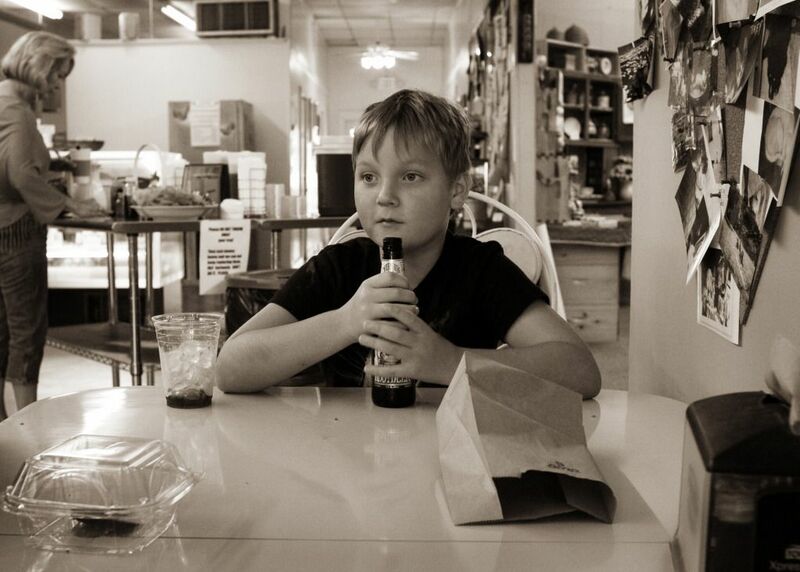 Jake was soon savoring his own gourmet root beer. “This is so good!” he enthused. But Jake could not be convinced. “I think I'll finish my root beer while we’re walking,” he said breezily. Finally, after much begging and pleading, Kris agreed to let him drink his root beer as we went. We headed out into the brilliant heat. Jake was holding his root beer, paying particular attention to the positioning of his hands. It was very important that the word “root” was covered up. Sophie rolled her eyes. Kris rolled her eyes. Jake strolled along merrily. We were passing all kinds of cute little shops with blooming window boxes. There were granddaddy live oaks dripping with moss. Finally, Jake finished his root beer. But he still wanted to carry the bottle. “Why are you still carrying that bottle, Jake?” Sophie demanded. Well, Jake just loved that idea. He finally let Kris take the bottle, but he wouldn’t let her throw it away. “I want to keep it in my room,” he said. “I just like it,” Jake said. Jake was excited. No, he was obsessed. He spent the next 15 minutes begging his mother to stop at Publix on the way home and buy him some root beer. “I know what I’m getting Jake for Christmas,” I said. We went to a couple of little shops, and then we headed over to the house Bunny has been looking at. I’ll take this time to tell you a little more about Monticello. It’s the most romantic little town, a place time forgot. 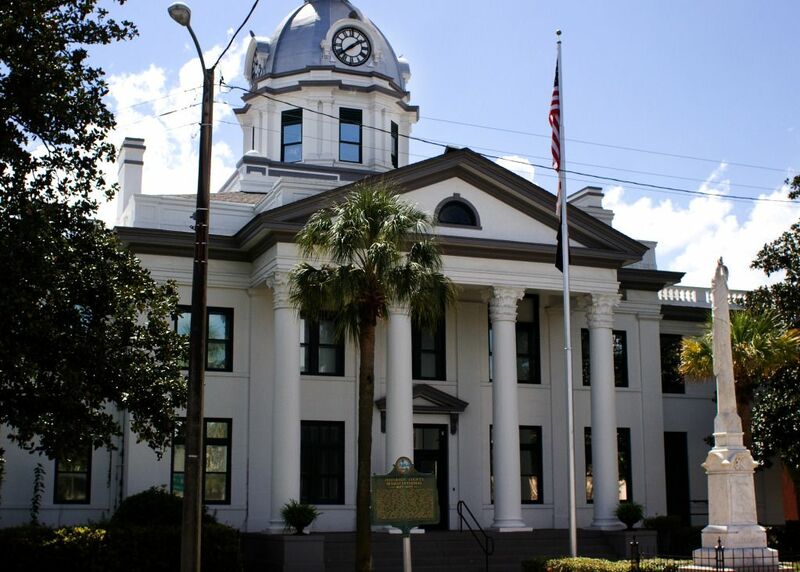 There are live oaks galore, and white mansions and little shotgun houses and a courthouse like a wedding cake. The streets are so narrow, and some of them are dirt; many are canopied. I couldn’t believe how beautiful “Bunny’s house” was. 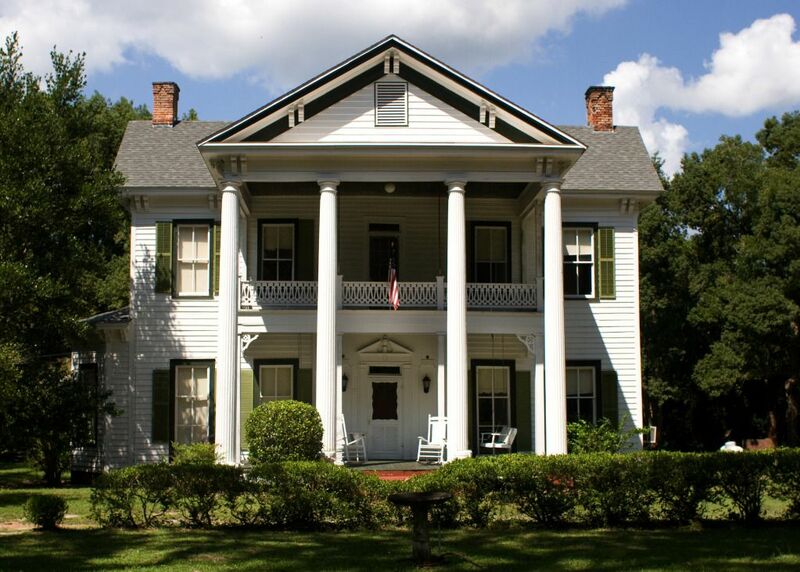 Greek Revival style, with white columns and green shutters, it was surrounded by old live oaks, sago palms, and cabbage palms. 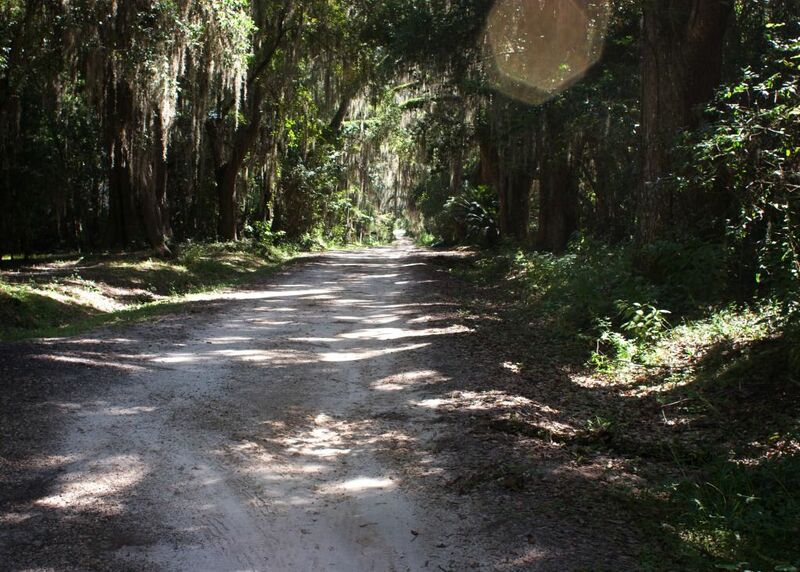 There was a curving dirt drive outlined by ancient boxwoods. The sheer oldness of the place gave me shivers. We stood out front taking pictures and ooh-ing and ah-ing. We strolled around the perimeter of the property, which took up a whole block, to see the forest of invasive species that would be Bunny’s if she bought the place. Among the potato vines and bamboo, there were collapsing barns and other outbuildings. Bunny was excited too, but she was containing herself much better than I was. We went back to the front of the house and just gazed. It was just so big and grand and stately. I had goosebumps. We had lunch at a little pizza place, and then after Mom and Kris and the kids went home, Rob, Bun, and I went back to “Bunny's house” to take a second look. I was too excited. “Just look at those columns! Just look at this row of live oaks! Look at those huge porch swings and the blurry old windows and all the brick chimneys!” I was blabbering on like an idiot. We loitered around on the street for the longest time, and then a man came out. “Hello!” Rob cried in his friendliest voice. “We were just admiring this beautiful house! Are you the owner? . . .” And in five minutes we were inside taking a tour. The man (I’ll call him Bob) had grown up in the house. His parents had bought it in the sixties, and there were old black-and-white pictures on the walls showing the house back then. There was a picture of the family painting a picket fence around the front yard. I recognized Bob as a little boy. The house loomed in the background, looking the same then and now. The house was so interesting because almost nothing had been updated since . . . since maybe the 1930s. There were cracked plaster walls and huge, heavy doors. Wonderful old mantelpieces, fireplace after fireplace, floor-to-ceiling windows, the darkest old wooden floors (the floorboards were so wide). There was a beautiful mahogany staircase, and a big airy, roomy landing upstairs. There was a second-floor balcony with a breathtaking view of the neighborhood. On the way home I couldn’t stop talking about the house. “Oh, think of how much fun your cats would have living in a mansion!” I said to Bun. That might have been my dumbest argument as to why she should buy the house, but I don’t know. I was saying a lot of dumb things. That is a wonderful old home. It's so nice to see that some Florida towns have been untouched by development and still ooze that laid back southern feeling. And, yes, that was a funny story about Jake. Kids are in such a hurry to grow up. Thanks, Susan. Monticello is so interesting; it really does seem untouched by time. I need to go back and get more pictures--there's an old, wonderfully creepy opera house with the most beautiful stained glass windows. So many neat little towns around here. I like the way you describe the town. Apalachicola is another neat little town to check out if you haven't yet. Oh, yeah, Apalachicola is great. My family and I stay at St. George Island twice a year and we always go to Apalachicola to shop and have strawberry phosphates and take pictures.